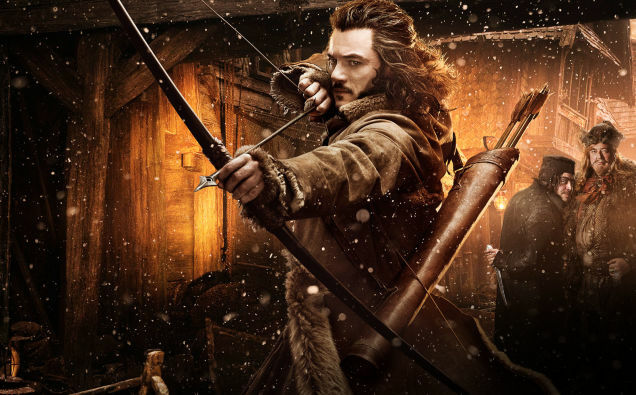 “The Hobbit: The Battle of the Five Armies,” is the final installment in Peter Jackson’s trilogy of films based loosely on J.R.R. Tolkien’s first fantasy novel set in Middle-Earth. Unfortunately, Tolkien gave the battle short shrift in the book, leaving Jackson’s scriptwriters to rely mainly on their own imaginations, which run to vast, computer-generated mob scenes of battle without much of the charm and wit that enliven the book. The story, briefly summarized, revolves around the fact that Smaug the Dragon is killed, and the dwarves retake Lonely Mountain and its enormous hoard of gold, only to be confronted by human refugees from Laketown trying to cash in on the dwarves’ promise to share the loot, plus the elves trying to recover some sacred jewelry. Gandalf the wizard comes along to warn of impending doom, and Bilbo Baggins goes about looking puzzled and asking why everyone can’t just get along. Then the orcs show up to try to kill everyone. The fifth army (I think) consists of eagles and bears on the allied side. Naturally, there is a huge battle, complete with earth-eating creatures who punch holes in the ground to help the orcs infiltrate the combat zone. I hate it when they do that. Plus there are bats who are supposed to terrorize the good guys but also provide Legolas a ride up a mountain when he needs it. The formulaic, almost Power Rangers-style fighting is interrupted by a couple of interesting single combats, but the warfare is well below the gripping level set by Jackson in the remarkable “Lord of the Rings” movies. The “Rings” trilogy won 17 Oscars, an honor that has eluded the “Hobbit” series. Despite the abundance of gold in the recesses of Lonely Mountain, it seems unlikely that this film will bring home Hollywood treasure. “Foxcatcher:” crime drama or portrait of madness?